Extraordinary Rare Property. Private-Gated-View-TC-Pool Estate Property. 1.28 usable Acres. Builders and Owners Opportunity to develop or Remodel this rare and amazing VIEW, VIEW property. 1.28 Acres, 2 Bedroom Guest-house. 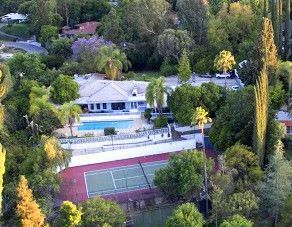 Private, Full Tennis Court, Large Pool and expansive green Lawn. On-site parking for 20+ cars, 3 Car Garage, Circular Driveway - Motor court. Private Gated Property with Tree lined 2 lane Driveway. One Story Home over 7000 sf. Home features 2 Master Suites, Formal Dining Room, Family Room, Music Room, Large Kitchen with Island and Built-ins. Maids Suite, Gym. Party Bar with View, Veranda, Decks, Fruit Trees. Most rooms face City Light View. Room to Play and Grow. Home has been host to many celebrities and parties of 300+guest. Fruit Trees, Pond. Close to shopping and Entertainment and Transportation. One of the last great properties that can still be yours. House is one story 7049 SF and Guest House is 734 SF per appraiser and owner. Seller ready to move. Property is being sold "As Is"
*SF by Appraiser. Buyer to check sf, permits and do their own investigation of the property. The home and property are beautiful.